Nestled in the core of South Jackson Civic Center (SJCC) is Tullahoma’s first public school building, with the old exposed brick walls and cornerstone still intact. This original part of the structure was erected in 1886 at a cost of $6,000 and consisted of six classrooms and two study halls. A year after South Jackson School was opened, 350 pupils were enrolled and taught by six faculty. Tullahoma and the school were growing, which led to additions to the building in 1922, 1938, and 1950. 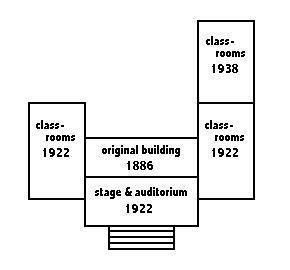 But the 1922 addition of the acoustically renowned 460-seat auditorium would eventually save the historic facility from demolition. By 1972, the South Jackson School was no longer in use. The school board announced in 1977 that the building would be torn down. A group of concerned citizens, lead by Mrs. Alice Harton Ratcliffe, banded together to save the building with several goals in mind: (1) to save, renovate and preserve the historical landmark, (2) to satisfy the need for a regional performing arts center, and (3) to establish a museum of local history within the building. With consent of the city school board, volunteers formed the not-for-profit South Jackson Civic Association (SJCA) and began hands-on work on the building and raised funds to accomplish the feat. Volunteers came from everywhere: the Tennessee National Guard, Arnold Engineering Developing Center, the Boys Scouts, the Girl Scouts, area civic clubs, and local church groups. The downstairs portion of the building finally reached operational status in 1979. Today the center is the only facility of its kind in this region. It has hosted more than 2,500 events, and includes a 400-seat auditorium with full stage and proscenium arch, the Floyd and Margaret Mitchell Museum, the Donna S. London Rehearsal Hall, and Community Playhouse, Inc. offices. There are reception rooms, workshops, a green room (actors waiting area), a concession stand, and other offices and work areas.